1. trace the shape of a man on large tracing paper. Make him a pudgy man because he needs some room for seams, especially on his arms, legs, and neck. 2. cut him out and trace him onto two pieces of fabric (in my case, some extra cream colored fleece type material. 4. If, like me, you do not envision yourself designing and sewing a bunch of doll clothes, embroider some clothes on him now! I just gave each guy a pair of shorts and a t shirt. The boys insisted on belly buttons, too. 6. Add the hair. I made curls by knotting the end of a doubled piece of yarn, and repeatedly putting the needle through to the right sides and then back out (to the wrong sides that I could see since I hadn't turned him right side out yet) and then knotting it again, leaving some slack so that his curls could be pulled out long once I turned him right side out. I'm sorry this is so hard to explain. Basically I'm taking a very slack stitch with a doubled over piece of yarn, then knotting it before starting the next slack stitch. 7. Turn him right side out. 9. Stuff him with whatever you'd stuff pillows or stuffed animals with. Keep pushing it in there tight so his arms and legs don't end up floppy! 10. Sew the last seam shut. 11. Sign and date your work in case this guy becomes a well loved guy to pass down. The whole process probably took me three or four evenings to make. (spending an hour or two each night...while watching t.v. with Greg...the hair took the longest!) I'm sure there are some wonderful doll patterns out there, but if you're looking for a simple one to make right now, give this a try. The only thing we had to go out and buy was the yarn for the hair. Let me know if you make one of these...I'd love to see it! And did you notice that little Tyler wanted rainbow colored hair for his guy? Yes, it quite suits his personality, my bright spot of a boy. I'm going to throw these guys in the washer soon, as they had some adventures in Yosemite. I'll let you know how they hold up. I don't know what it is about September, but once my birthday passes, my mind moves on to Christmas. I'm dreaming of a crafty Christmas, and it's inspiring me to do some quick projects...just little this and thats for various people and purposes. The train tote was a must, as Jake's school doesn't allow backpacks, so that was finished the day before school started last week. Meg asked about the fabric, but I'm sorry to say I don't know where to find it. I picked it up at my local fabric shop several months back, after trying (and failing) to convince Jake that maybe he'd like some different kind of fabric, since he had trains on his tote bag last year. No such luck. But isn't that brown and white striped handle cute? 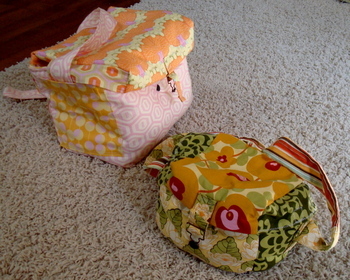 And what about that cute "jeans" stretchy handle on the long blue bag...they're both from my new bin of goodness below! But I digress. The blue bag is for Auntie Amy & Uncle Rob, who are getting the keys to their new downtown San Diego loft today! We're going down on Thursday to "help" them settle in, although with two small boys in tow, I'm not sure how much "help" I'll actually be. But the best part about their new home is that it's directly above the baseball stadium, which houses a playground and a miniature baseball diamond where kids can play any time they want to! Way to go, Amy & Rob; you picked the right building. So the blue bag is some heavyweight fabric I've had around for a while, turned into a tote with a drawstring at the top (also from my new bin of stuff) for the baseball bat and whiffle balls the boys wanted to give them as a housewarming present. On the left is a pretty little flowery fabric that reminds me of Little House on the Prairie. This is exactly the fabric I picture in my head when I read about Ma's poplin dresses with sprays of pink roses on it. I have no idea if that's historically accurate, but I thought this skirt would make me feel like a prairie girl when I wear it. Which I haven't. Because I stink at sewing clothes. Just ask my mom. I did give it a good try, following Angry Chicken's 5 minute skirt pattern. An hour and a half later, I have a skirt that I will never wear. (at least not until I fix it.) It is in no way the fault of the pattern, it is completely operator error here. And it may have something to do with the fact that I chose fabric that needed a lining. And it really needed some eyelet ruffles to peek out below. But I have not given up on it yet. I'm just a little mad at it for the time being. Perhaps because of the above mentioned clothes-sewing disability, I have just finished two naked dolls. But if you look carefully at Jake's doll in the picture, he's not naked...thinking ahead to the hours of frustration that making doll clothes would bring, I oh-so-cleverly stitched some pants and shirts on with embroidery thread. There. They're dressed. And no, they're not dolls (I misspoke a moment ago) they're "guys." "Camping guys" for adventuring on our upcoming campouts this fall, to be specific. And wait until you see Tyler's "guy," he's got some wild hair, perfect for my wild baby boy. I'll do a separate post about them sometime. Just look at the old card those orange tapestry straps are wrapped around. I don't think I'll be able to throw it away when the straps are gone. I have no idea where this tub will go in my sewing space, but I'll take it, nonetheless. Thank you, Mom. Six yards of you has just walked through my door. Wouldn't my high school English teachers be proud? Did you notice the perfect Shakespearian sonnet rhyme scheme, the iambic pentameter and even the alliteration? I will leave you with some pictures of the subject of my poem, which are now available as precious baby blankets and burpcloths in my shop. I promised this post yesterday, but as it turns out, 32 was a pretty great birthday with too many wonderful activities packed in to have time for the post and my 100th post giveaway...yes, both fall on the same day! Yesterday was one of the best birthdays in recent memory. Breakfast in bed with my boys. Sewing on a present for myself and for you. A gorgeous lunch with just my mom and my sister. Researching which new lens I should buy as Greg's birthday present to me. Playing at the meadow, just the four of us. Dinner outat a delicious Cuban restaurant with dreamy ambience and good friends. Flan dessert at the restaurant, and chocolate dessert at home. A movie with family before bed. Aaahhh...perfect. As for the 100th post giveaway above...I'm calling it a picnic table cover/tablecloth/picnic blanket. Is that obscure enough for you? I'm going to use it as all of the above (I made one for myself and one to give away!) It's designed to fit perfectly on top of picnic tables, with ties to keep it from flying off, so that when we go camping we'll have a cozy cover to feel more at home...and really, I love seeing pretty fabrics out in nature. And when we're not camping I'm going to use mine as a tablecloth in our breakfast nook. It would also be a great little picnic blanket for a small fall picnic. I haven't tried yet (not quite finished backing and putting the ties on them yet) but I'm hoping the ties will be able to be used as a carrying strap for taking it on outings. We'll see. I'm loving the combination of vintage looking floral fabrics with the bolder brighter modern fabrics. If you'd like to give this baby a loving home, just leave a comment here on this post. I'd love it if you spread the word around, so if you'd like to post a link to this giveaway on your blog, throw an extra bonus comment on here for an extra chance to win. I hope you'll be as excited about yours as I am about mine! I'll do the drawing late Tuesday night or Wednesday morning, and since I'm a new little blog, you've got a pretty good shot at winning! I'll leave you with a few favorite birthday pictures. Happy Sunday. I've been a little distracted lately...I've been working on opening my new etsy handmade shop! There's so much to do when you start a new business, isn't there? I've done it once before, but that was before kids when life was quite different. I love the excitement of it, but will be glad to get back to home life as usual(keeping fingers crossed) once the shop is up and running. I've finally put my very first item up for sale here, and I've got three more camera bags coming this week, so take a look! And while you're at it, if you know anyone who carries their SLR camera around with them everywhere like I do, I sure wouldn't mind if you send them my way! I'm doing a grand opening sale, so now's the time to look. I'm in love with the bag I carry, and I know there's just got to be others out there like me. Have you graduated from carrying a diaper bag? I have, thank goodness. Do you carry your camera with you everywhere? I do, I confess. Do you like cute purses? Of course, who doesn't? If you've been around awhile, you might recall this post about my second attempt at a cute and cushy home for my precious camera, or this post about my third attempt, which somehow turned into a tote, or this one about camera bag #4 (with a glimpse at #1) which sits now on my desk, ready for carrying picnics or fishing tackle or small dogs or some other such ridiculously large item. But the moment has come...I have perfected the adorable camera bag and here she is! 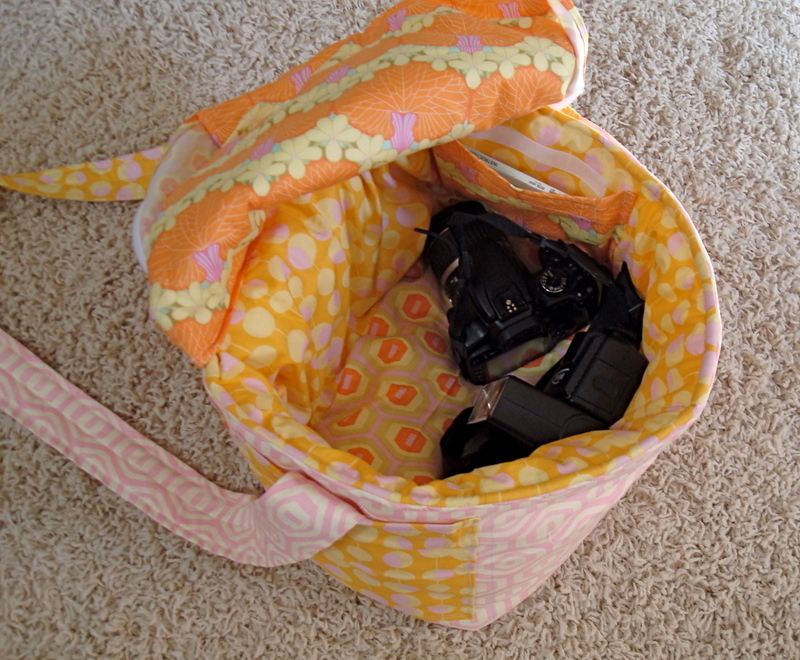 I assumed I'd be able to find a cute camera bag for my bulky SLR digital camera, just like you can find cute diaper bags in every fabric these days. No such luck. I scoured the internet and etsy looking for a bag that was padded to keep my camera safe from jostling, spacious for holding my camera and other necessities (wallet, epi-pen for Tyler's nut allergy, cell phone, wipes, spare camera battery, keys, you know the essentials), and most of all I wanted it to be made of adorable fabric. Preferably Amy Butler fabric. I honestly thought I would find this and was shocked that no one had made one for all of us who have moved on from cute diaper bags but want to carry our cameras without looking like tourists. I set out (on a much longer quest than I thought!) to create this perfect camera bag, and after many months of hard work, ripped seams, broken needles, and love, I have created her: the cozy camera bag. She is big enough for a camera plus a lens or flash, along with the essentials above. There's the outside cell phone and key pockets, plus a pocket on the back that closes with velcro for whatever else you'd like handy there. 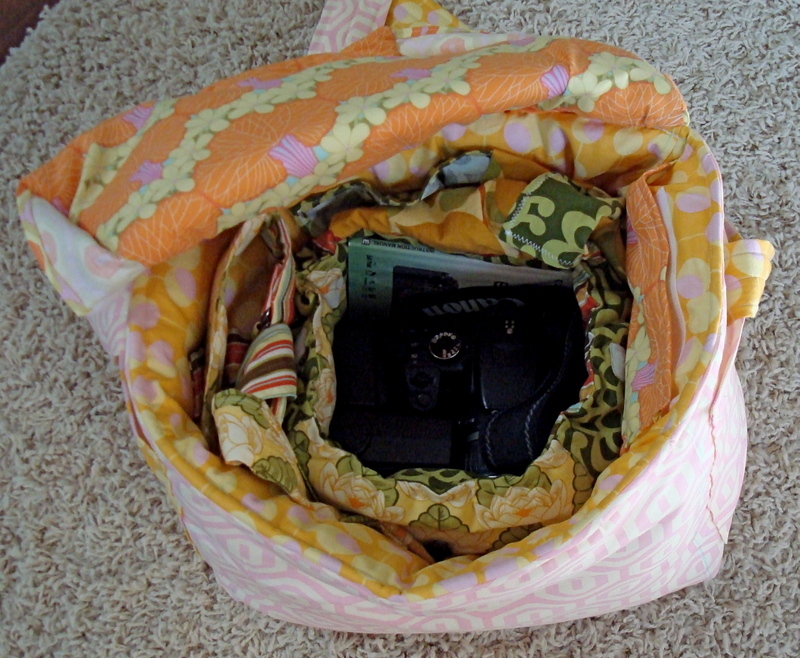 The inside is made with complimentary fabrics instead of just ugly cheaper black material, because, after all, don't I spend most of my time looking at the inside of my camera bag while taking or loading my pictures? I want it to look pretty for me, not just for others from the outside. That's just how much I like myself. It has a foam insert for extra padding on the bottom and through the middle, to cushion the camera from wild children or crowds. It has a lid that latches in the front and has velcro on the flaps on the side to keep the camera from spilling out if the bag gets tipped over. This one happens to have an extra vinyl lining in case of a sudden downpour. And most of all, it is beautiful. I carry it instead of a purse, and if I don't want to carry the flash or an extra lens, the bag squishes closed a bit at the top so it doesn't look bulky, but more like a trendy tote. I have been carrying the tangerine colored one everywhere, and now I have two turquoise ones who are waiting for new homes with someone who loves their cameras and cute fabric, too. Oh, I am so excited. I can't wait to get her into my soon to be opening etsy shop. If you know someone else who would love this bag as much as I do, or who needs a new home for her SLR camera, do send them my way, if you don't mind. I'd love to share my excitement and keep them updated on when I open my shop. Thank you! I will take better pictures when I get a chance, but I just wanted so much to share this with you all today! I know this post is ever so long, but if you'd spent the last five hours sewing, you'd be happy to be finished and feeling satisfied, too. Insert long sigh of weariness and a shout of Hooray! In any case, I DO have other projects, such as this lovely throw quilt to complement this quilt on our family room wall, which I finally pinned tonight after the boys went to bed. Someday (soon?) I will quilt it, and, yes, share it with you all. Well, here she is: Camera Bag #4. However, she has a problem. ...and yes, swallows it in one bite. Poor bag #1. You were just so small and helpless. 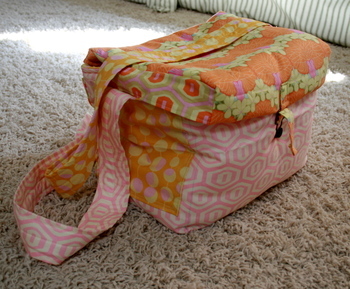 Do you notice how my very first camera bag attempt was probably my best? I'm considering searching for the dimensions of that first one and trying to replicate it while adding a few little improvements I've developed along the way. In any case, I feel like my newest attempt at camera bag perfection has, yet again, failed. I am taking suggestions for what I can do with it. My first thought was to use it to hold fishing tackle or something, considering its size. But I don't fish. Maybe a picnic basket? Please advise. Meanwhile, I'm on to camera bag #5. I am on the quest to create the perfect camera bag for my beloved Canon digital Rebel xTi. A padded, cozy, soft home, where I can take him with me without feeling like a tourist. I have been on this quest for about six months, and this is attempt number three, the one that got away and somehow became a tote bag. 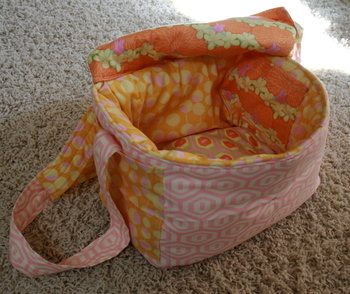 It is made of cute fabrics, it is padded, and even has a lining to make the sides water resistant for rainy days. But somehow it just didn't want to turn into a lidded camera bag, and now remains a very cute, padded, water resistant tote bag which I am sure to enjoy. On to camera bag #4. I'll keep you posted. I had the most wonderful morning yesterday...in my own tiny little sewing room with two of my favorite people: my mom and my sister. We had our own little sewing bee for several hours, and just laughed and talked and problem-solved each other's sewing projects. There's such an amazing connection between women who are coming together to make something and putting everything else aside. What could be more cozy? Amy made an adorable little diaper and wipe holder which will, I'm sure, be the next round of baby shower presents for all of us. I finished camera bag #3 and will post a picture as long as you're aware that it turned out to be a tote bag, not a camera bag. Darn. How these projects get such a mind of their own, I don't know. My mom sewed a bit, helped a lot, and tried to finish a Mother/Daughter book present we'd given her for Mother's Day years ago. In the end we all had something tangible to show for our hard work, and for just the cost of a mother's helper for my boys, we reconnected with just the ladies, which always makes me smile. 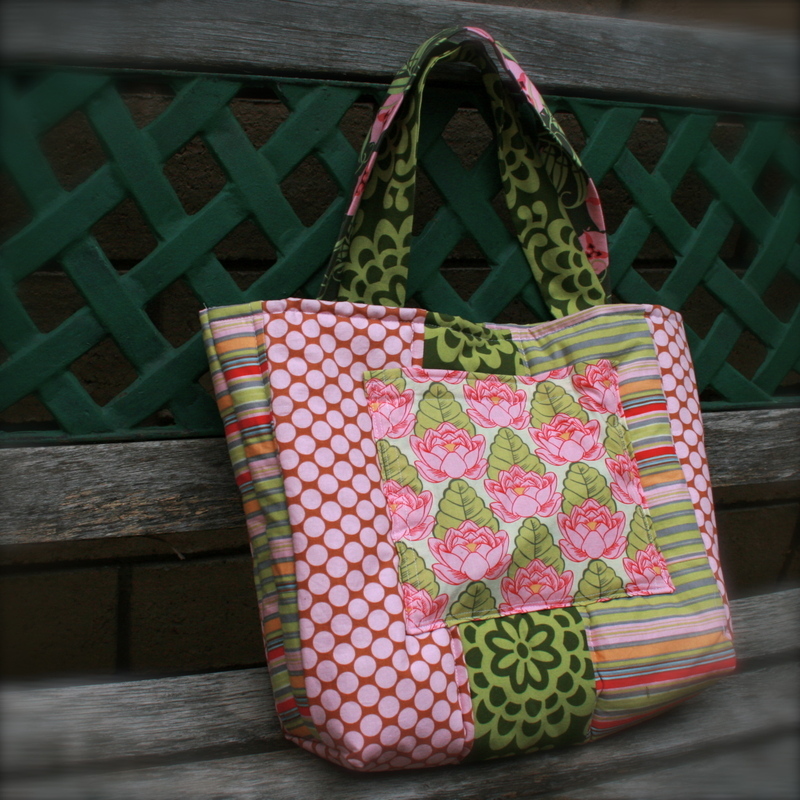 I am so very lucky that I learned how to sew when I was just a little girl. I think I probably started when I was 8 or 9. 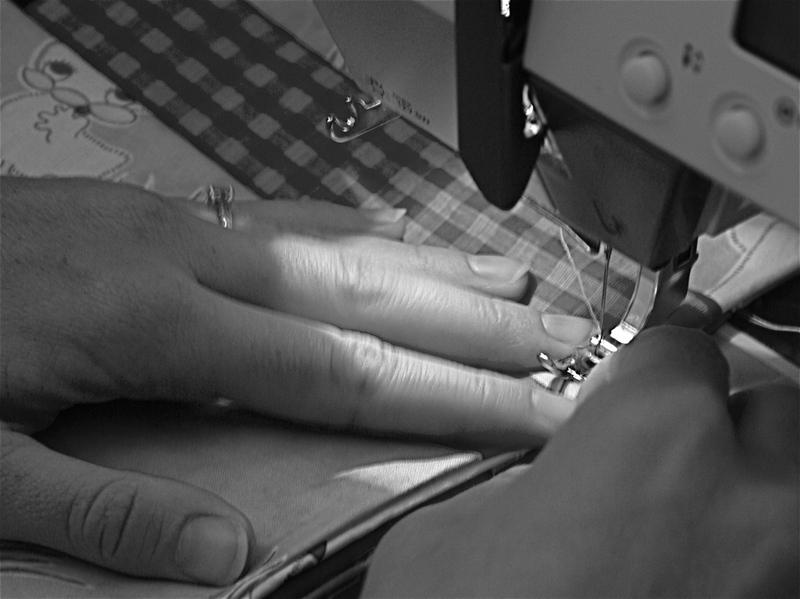 By age 11, my mom was giving quilting classes out of our bonus room, and even taught one for girls my age. 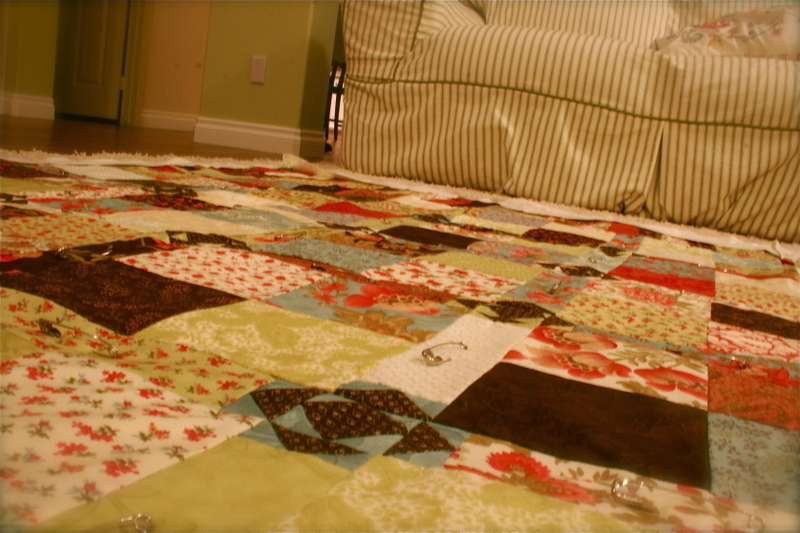 I think I finished my first quilt, a four square sampler, around that time. Now, I think I could just swim in fabric, I love it that much. The colors, the patterns, the feel of it, and even the smell. I love it. The problem with this love is that I just want to buy more and more gorgeous fabric, even just to put it on the shelves in my newly cleaned sewing room. Ahhhh. I have recently vowed not to buy any more blankets, throws, comforter covers, etc. from Target or Ikea, two of my favorite stores in the world. Yes, they have the most adorable things at dirt cheap prices. But if I make it, it just means so much more. If I make it, I treasure it. Have you tried making anything lately? I will warn you, it's so addicting. I am in the process of making a throw quilt for the family room to coordinate with the new decor. I will be sure to share it with you when it's done. 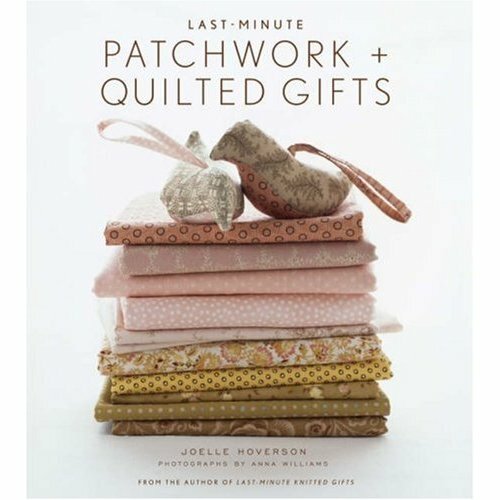 I need to finish it soon, because a new quilt on the cover of a magazine caught my eye, and I have it in mind for some of the fabrics I picked up at the Material Possessions anniversary sale. I can't wait to start it, but one thing/quilt at a time, I remind myself. That is the hardest part. Yes, I DID manage to finish the camera bag for my trip. This is my second camera bag attempt, and while it's more padded than the first, it still seems too boxy for me. My hope is create a bag that doesn't stick out so far from my body in this boxy way, yet can hold my essentials: camera, battery, lens cleaner, wallet, cell phone, chapstick, diaper and wipes. Yes, that is why it's so big. I'm in that transitional diaper bag phase. The next attempt will be longer and narrower with an outside cell phone pocket and a pocket on the outside of the back for the wipes. Hopefully that way the whole bag can be a bit skinnier. Or oval. Not sure which. Isn't it fun to create something new out of nothing? To be able to make something exactly how you want it to be instead of having to rely on someone else knowing what your personal needs are? I'm really enjoying that aspect of this camera bag making quest.